When you are working on the same project day in and day out, things start to become a blur. 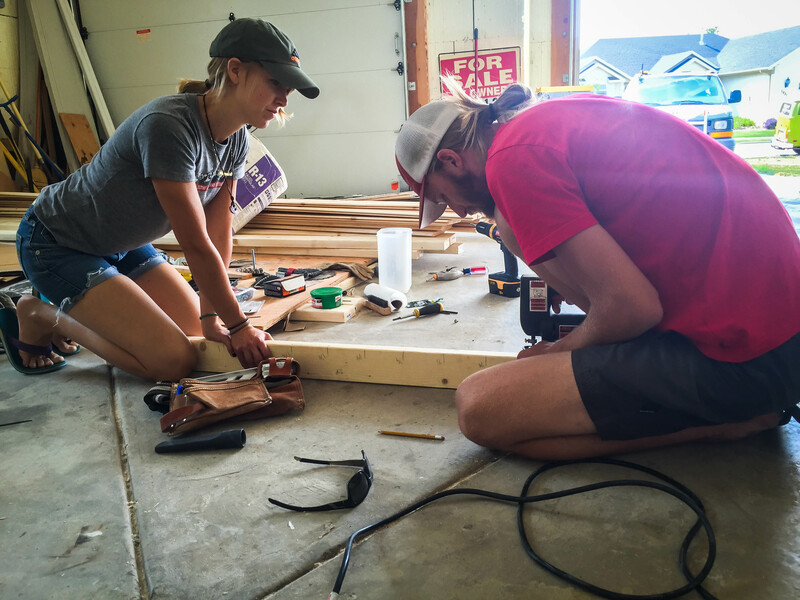 Building the roof has felt like a single continuous day– a long, exhausting continuous day of building. We have been lucky enough to find support and advice from family and friends along the way. A neighbor saw us building our new home and offered his professional advice, as well as generously donating supplies which included some spare aluminum drip edge he had left over from a job. We installed it straight to the frame to cover the existing rain gutters on the van and keep water from sitting in there and rusting and rotting our baby. We used ample amounts of silicone to make sure water stayed out of the rain gutters. The rest of the sheeting material we used, (OSB and tongue and groove) would then sit on top of the drip edge so that water rolls off the walls, hits the drip edge, and moves out over the gutters and runs down the walls of the van and off onto the ground– where it is absorbed, making its way though underground aquifers to the ocean, where it will evaporate and, rise into the atmosphere, turn into a cloud and fall to the earth again as rain, hit the roof of our watertight van, roll off, and start the cycle all over again. This step is pretty straightforward– cut boards to the shape of the frame, both sides and top. The key thing to mention is that we continued using construction screws instead of nails for the remainder of the build to make sure things stayed solid. Here we again mention the generosity of friends who donated construction supplies in order to waterproof our van– those supplies being quality house wrap and roof taring. The minimum purchase of such supplies would be costly on our own seeing as we only needed a few scraps to get the job done. To anyone following our footsteps, I would suggest talking to someone in the industry and see if they have any leftovers to purchase for a discounted price. We covered the top and sides with the house wrap, folding it at the corners instead of making cuts (like wrapping a gift) and secured it with staples. The taring was only used on the top of the van where it is flat and has more potential for water to stand. It came with a sticky side, but we also secured it with special staples. build from, the kid really pulled together a pretty incredible masterpiece. We chose tongue and groove more for aesthetics than anything else, but also found it to be functional as well. The inch thick boards slide together causing water to roll past and down to the drip edge. After slapping a couple layers of a recommended oil-based deck treatment to each board, Matt made the difficult cuts and mounted the boards. Before putting the tongue and groove together we filled the groove with glue to secure it to the board below it, then nailed along the top of the board to secure it along its length, and once it was all together we put two construction screws in each end of each board. In other words, these boards are going nowhere. The finishing touch was adding trim to the corners and the two seams up front and along the drip edge. This not only covered the gaps in the boards and made it look better, but it also makes it easier to seal up the seams with silicone, which we used a lot of– over $100 worth. We have put it to the test and its water tight! The strange looks we got when buying a whole case of silicone tubes at the hardware store was worth it. Ok so its really not made of tin, but we found a guy (through the help of our construction friend) that agreed to bend a piece of 18 gauge steel to the exact shape of the top of our van. This was a step that miraculously came together without intention, as our original plan was to finish the top with the same tongue and groove as the sides. Our biggest concern (as we have mentioned many times before) is to keep things water tight throughout the rough winter conditions, and our dear construction friend shuddered at the idea of using anything other than a solid piece of metal on the horizontally plained roof. It cost a few bucks more than we budgeted, but we are extremely pleased with how it turned out. Having the peace of mind to know we won’t be affected by water seeping its way in was worth every penny. 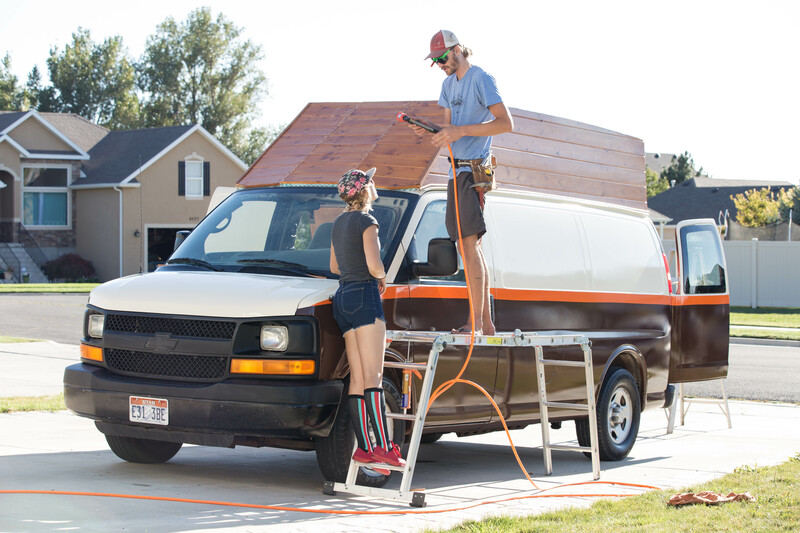 We assembled the dream team to lift the 80 pound roof onto the 8’8″ van. This consisted of Matt (6’7″) his Dad (6’8″) and our buddy Mikey (6’5″). 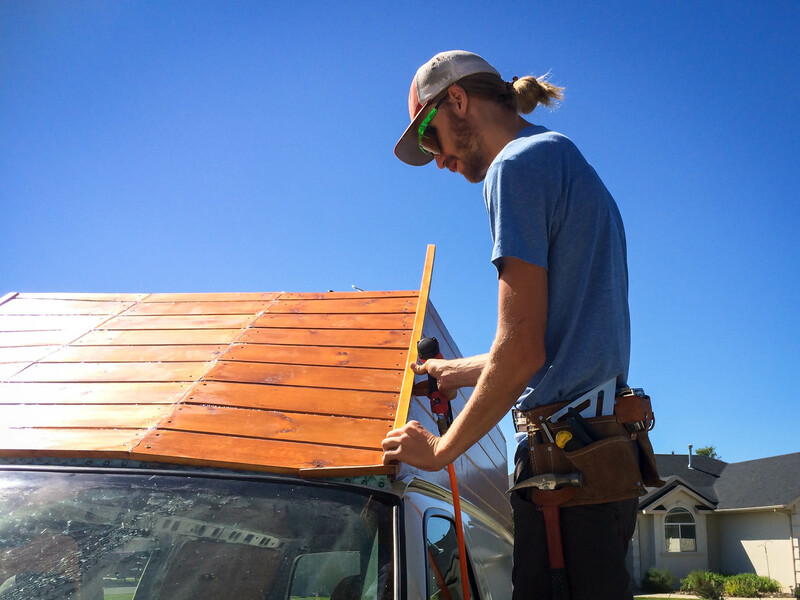 We put a layer of liquid nails down first and the shiny roof fit like a glove, we secured the edges with self sealing screws, and cut out the hole for our roof vent and installed it, all the sudden the exterior of the van was done! Our extension has been complete now for several weeks– in that time we have used the bus not only as a daily commuter (by commute I mean the many daily trips to the hardware store) but we have taken it down to the Utah desert driving though and camping in an autumn thunderstorm. We have put it to the test and it has been more successful that we could have imagined. Also, we are pretty sure the new top can double as a boat if we ever flip over into water, which of course is an added bonus. How much weight do you think you added with all the materials? Did you consider using the roof cut out for the top? I would guess that just the top weighs in around 500 pounds. I did not really consider using the piece of roof I cut off as the top. I think in order to do that you would have to make the sides of the extension lean in more so that the area of the top of the extension is smaller than the piece of roof you cut out. I found a guy that did custom HVAC and he got the steel I used for the top and bent the sides for me. That looks amazing! I was wondering if you’ve had any issues at all since you completed the roof? Are there any things you’d do differently? Does it drive okay with a wooden roof extension? I’m looking to possibly do this and save some money on a fiberglass topper. No issues yet, it didn’t leak all winter and its still going strong. Since we have had no issues with it, I have not put much of any thought into what I would do differently if I had to do it all over again. It drives just fine. Catches the wind a bit more if you have cross breezes going on, but cornering and other handling is fine. Great job! A DIY topper seems more and more appetizing since prefab tops are so pricey!! Did you ever consider using fiberglass on the exterior to help with both the strength and with water proofing? I would also assume it might help cut down on some of the weight. Hi Jakob. I did not consider using fiberglass. I know it’s lighter and stronger than wood of the same thickness and weight, but my roof is way stronger than a fiberglass top and I like that I can stand on the roof, rig a hammock inside or outside from the roof to a tree and also I don’t know how to work with fiberglass the way I know how to work with wood. So far it’s lasted two Utah winters and we have not had a single leak or needed to do any upkeep on the roof so I’m pretty happy with how water/weather proof it is. I was wondering if using 2″ x 2″s instead of 4″ x 4″ would have lowered the overall weight, while still providing a similar level of stability. 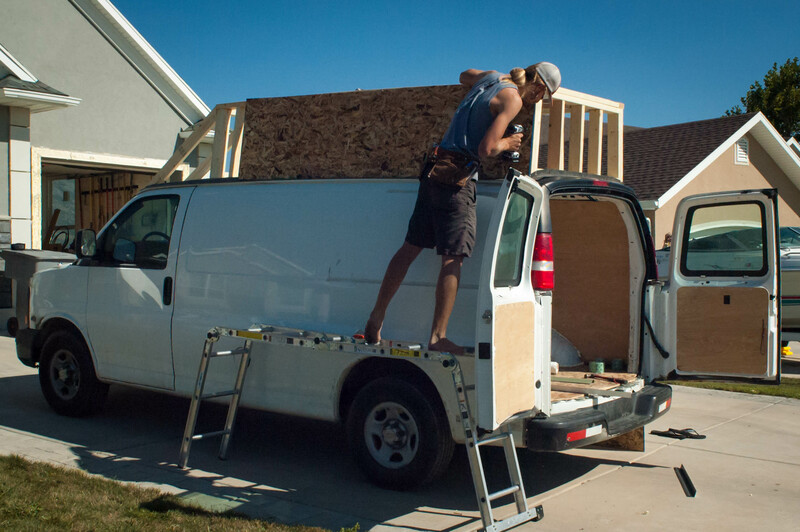 Getting ready to raise the roof on a van and the price for prefab ones is just way too much. Thanks for the example. No worries! We’ve seen 3 or 4 other vans that have used our design and we are stoked about it. I don’t think 2×2’s would give you the same strength as 2×4’s. They might work but honestly the roof addition doesn’t weigh that much. I wouldn’t go any smaller than 2×3 for the roof. I used a lot of 2×2 and 2×3 in building the bed and cabinets inside our bus. They do work great for saving money and space over 2×4’s but definitely not as solid. Do you think if i build the roof on top first and then go inside and cut opening..it would make a big difference? Yes I think that would make a huge difference. 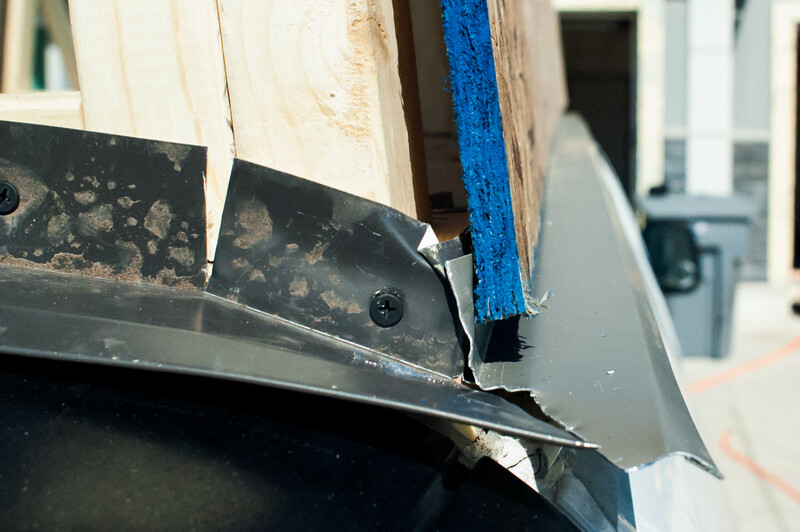 It would be impossible to attach the roof extension directly to the support frame along the sides of the van without first cutting off the sheet metal that covers them. House wrap, gotta admit that did not occur to me. Looks nice. I wonder if getting a sheet of aluminium, one continuous piece for the entire hightop could work. Or a sheet larger then the roof with aluminium sheets for the sides with a generous overlap. Mostly I’m spit-balling for my own build. Thanks for the inspiration. We have that continuous sheet of steel on top that folds down 1 inch on all sides and it works really well. For low maintenance all steel would be perfect. I would do the sides with their own sheets and then overlap with a top peice like I overlapped my wood sides. That should be bombproof forever! For just the roof extension I think it was around $800. $800 for the entire build? That’s not bad! Good work btw. This helps a lot and i appreciate you posting your work. I was browsing the net looking for roof extensiin ideas to see if it’s monetarily feasible. I have a 1990 Chevy Suburban that’s in great condition. I just want more room! I may be living out of it soon. How long did the entire build take you? Thanks again. Thanks man! $800 is a rough estimate for just the roof extension. The entire build cost much more. I think the roof took us 2-3 weeks working 5-6 days a week and 10-12 hours a day. The whole build took 10 weeks working the same days/hours. Good luck man!